This project would be so far off, I don't even know why I'm mentioning it, but I had a thought about the shelves in our office the other day. When I updated this room a few years ago, I left most of the stained wood as-is. It's nice, but it's just the right color to make the room still look a bit dated. I've never wanted to paint it white, but the thought did occur to me that I might get quite a dramatic look if I painted it dark. Although I LOVE to paint things black, I'm thinking just a click or two lighter though, like a peppercorn or really dark charcoal. The big hold-up would be the amount of area I would have to cover. The shelves. The desk. The wainscoting. The plantation shutters and window trim. The crown moulding. The closet doors. Whew! I'm pretty sure I would need to cover the floor and white walls and just spray the entire room! :) I'd also have to think about what I would need to do with the ceiling. This project would be one big domino line! I spent a little time looking for some good inspiration images, and this one probably comes the closest to what I would be heading towards. I'd keep the white walls and we'll be moving our tan sofa into that room soon. I'm also imagining how it would look with the leopard carpet. What do you think about dark bookcases and trim? It might be a year or two before I would get around to it, but I think I'm smitten! Don't forget, tomorrow is the first installment of the Summer Style Soiree! Come back and see what project I did inspired by Audrey Hepburn, and link up something of your own. Anything Audrey inspired...an outfit, accessory, home decor, recipe...I can't wait to see what my co-hosts and you have come up with! Love the idea. We built our house thirty-five years ago, and yes, all our woodwork is stained. I know we will never paint it, but our family room built in bookcases, well that's a different story. I'm leaning towards the gray from your examples to lighten up the room. I've always loved the navy in the room. But never the stained woodwork. At the time of original post, I painted everything white in a similar room in my old house. Yes it will be the biggest pain in the back to paint. But the difference will make it completely worth it. You will need a ton of caulk and a huge amount of patience. I totally think spraying it is the way to go. In my current home, the builder sprayed my built ins and didn't take out the shelves, when I went to decorate the shelves...I had I've voids. I was so mad! I love the black/fox examples. Not the gray. I don't think the gray is you. oh i love the idea!!!!!! do it. now. don't look back. I am DEFINITELY in favor of the project! But I see what you mean about it being a HUGE undertaking! Maybe if you just concentrated on one wall at a time? Best of luck with it! Would love this in your office - it would look fabulous! Oh YES! Big FAT YES! It would look so so good. 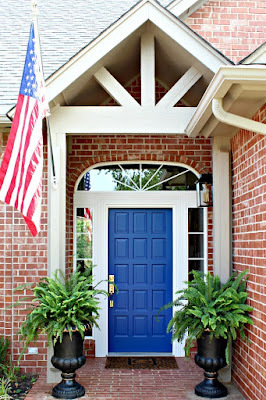 Have you ever thought about the General Finishes Java Gel Stain? It is super easy to apply (I would only do it if it was super easy) and I think it might give you that dark, but not too dark look that you're doing for!! Oh I think they would look fabulous. 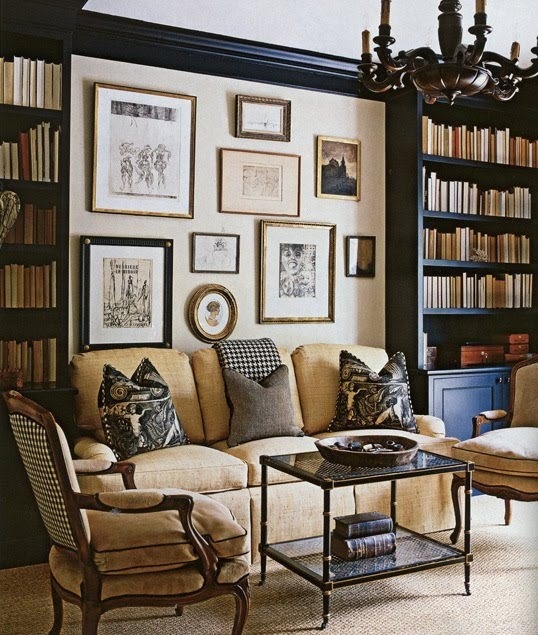 Love the black bookcases, white walls and tan sofa. Amazing. Can't wait to see what you do. 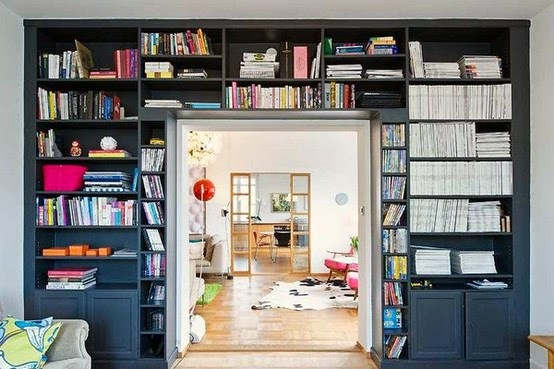 I think it offers such a nice backdrop to let everything in the bookshelves really pop. I say go for it! I know my hubby will freak out but I love it. Go for it Jennifer! You have a way with black, you make it look good whatever you do. I think it'd look SO fab!! Very chic! GO FOR IT! I love the NEW ENGLAND HOME bookcases the most. 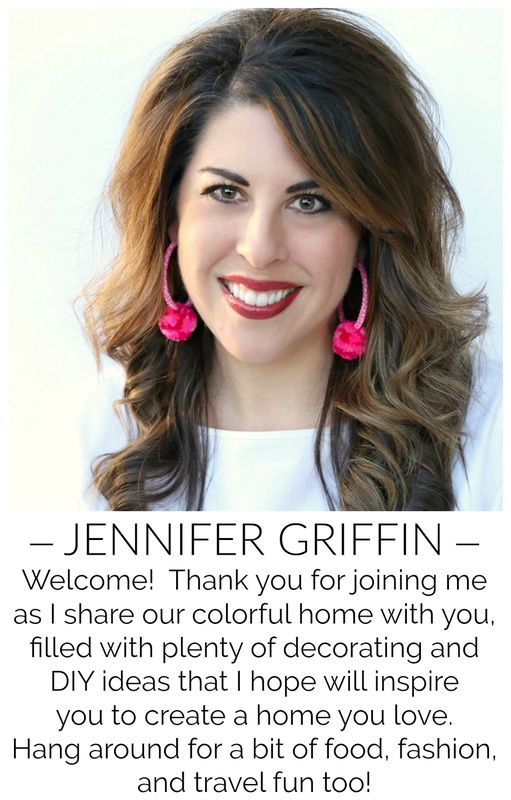 Your right Jennifer, it will be a huge commitment, but in the end, I think it will be worth it since you'll definitely have a whole new room for sure! yes yes yes....they would look fabulous painted dark!! 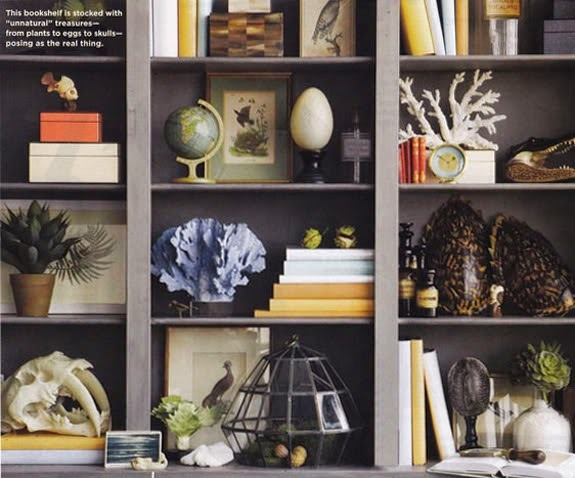 I LOOOOVE the look and have a bunch of black and dark grey bookcases pinned. It would be great for your study - so dramatic! Fingers crossed you do it! go for it! love the look! I have no problem with the idea of painting your wood in that room. I love black and dark grays myself. I might suggest you go back and re-read, and re-read, and then re-read your third paragraph again. Then I would start saving my pennies and plan to hire this project out. You did say it was an idea for the future. I have done painting projects myself, and I have hired painting projects done by professionals. The difference is unbelievable in my opinion! Especially something of this magnitude. There is a very good reason they are called Professionals! Love that idea, Jennifer! The gray would be stunning! Yes, it's a lot of work; but, you will be so pleased with the results. And a leopard carpet would be the icing on the cake! Well I am totally with you on feeling overwhelmed with how much work would have to go into this. I do that all the time when I'm thinking about projects. BUT...I think dark bookcases would look amazing. Like AMAZING amazing. 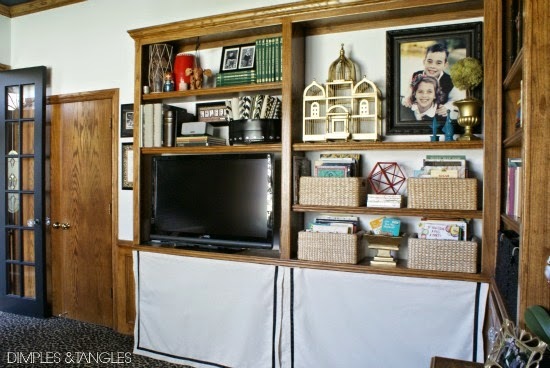 I have a perfect solution for you if you don't want to commit to painting.....this past Fall I bought dark burlap and sewed panels to fit the back of my bookcases. I then took clear push pins and hung the panels on the back of the bookcases. I loved the dramatic look and I can change it out anytime. The molding on the top of the bookcase and the items at the bottom of the bookcase hide the push pins. You could do a dark burlap (or any sturdy fabric) for the same dark effect. That would look so good and be so dramatic! I think it would be really pretty with your leopard carpet! I have so many projects that I want to start on, but they all would start a major domino effect!